First, what the charge is not. 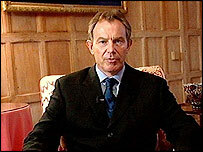 It is not that he won’t apologise for the Iraq war. The cult of apology is a diversion. If a political leader has misled parliament and the people, whether deliberately or from incompetence â€“ and our prime minister has done so â€“ to such a degree that an apology is required, then the only thing he can properly do is resign. If a political leader receives intelligence which carries a plain caveat that the information is patchy and sporadic, and he repeatedly tells parliament and the people that the information is certain and reliable, and a solid basis for the decision to go to war, then an apology for that gross misrepresentation is irrelevant: there is an inescapable obligation to resign. If a political leader has made a public pledge that he will not take his country to war unless certain specific conditions are met, and those conditions are not met, but he takes his country to war anyway â€“ and our prime minister has done so â€“ then his duty is not to apologise (and then to carry on as if nothing has happened), but to resign. Mr Blair says he ‘can apologise’ (but signally fails to do so) for the fact that intelligence reports asserting that Saddam Hussein had weapons of mass destruction turned out to be wrong. But, as he must know, that is not the issue. The intelligence was not itself ‘wrong’: it conveyed reports which it warned were not to be relied on. It was the way the information in them was presented to parliament and the people by the prime minister that was wrong. That is a resigning matter. If a national leader acknowledges before a war that there can be no justification in international law for the use of force to remove another country’s government, however repressive and unjust that rÃ©gime might be, and then, when the only positive result of his war is that a tyrannical government has been removed by the use of overwhelming force, he claims that result as a sufficient justification for having gone to war, the only possible conclusion is that his credibility has been fatally undermined and he should resign. A recent letter in the Guardian argued that Tony Blair should resign over Iraq, "and perhaps Jack Straw as wellâ€?. It doesn’t seem to be generally understood that if a prime minister resigns, his entire government resigns too: all ministerial appointments are at the disposal of the new prime minister as soon as he or she has been commissioned by the Queen to form a government. Responsibility for the Iraq disaster is necessarily shared by all those who were collectively responsible for the actions of their government, not confined to any one man, notwithstanding that he acted autocratically and without proper consultation with his Cabinet and other colleagues. It was up to them to insist on restraining him, calling him to account for what he was doing, and if necessary threatening mass resignations if he persisted in his folly and deception. With the honourable exceptions of Robin Cook and Clare Short, they failed in that duty, and in that failure they share the responsibility for the biggest humiliation of British diplomacy since Suez, almost half a century ago.